Rabbits can make excellent pets! They are inquisitive, sociable, gentle, and intelligent. They don't have to be walked and usually learn to use a litter box quite easily. Rabbits are social animals and therefore are ideally kept in pairs in a large living area which allows them space to be separate from each other. It's important that rabbits are of similar size. If one is much bigger than the other, it may bully the smaller rabbit causing stress or accidently causing injury. Rabbits do live a long time, averaging between 6 and 10+ years depending on the breed. Rabbits are clean animals by nature. If they're kept in a hutch, it should be large. They require a separate litter area which they should have access to at all times. The litter material must be changed regularly. Proper handling of rabbits is very important. If held improperly, a swift kick can easily cause a rabbit to dislocate or break its back. When carrying your pet, always support its entire body and hind end. NEVER pick up your rabbit by its ears. Rabbits must be fed daily. They are nibblers so rabbit food and hay should be available at all times. We stock high quality rabbit food at our clinic. Rabbits are known for their breeding abilities so early spaying/castration is recommended to prevent breeding and to decrease both medical and behavioural problems. 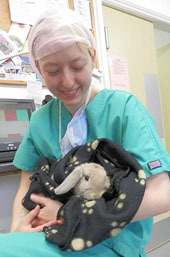 As with dogs and cats, rabbits also require regular visits to your veterinary surgeon. Rabbits are commonly seen for annual health checks, neutering, gastrointestinal and urinary tract problems, dental checks, skin problems, and upper respiratory diseases. 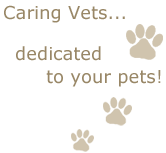 Through proper veterinary care and diet, most problems can be prevented. To enhance your rabbit's diet, we stock a wide variety of delicious Burns Rabbit Foods. Please drop by to learn more about caring for your pet rabbit and to check out the special rabbit foods we carry. To keep them healthy and happy, each species of animal requires specialized housing, diet, grooming, care, veterinary checks, and knowledge. 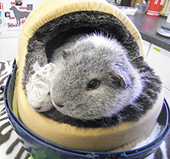 Please feel free to come in and talk to us about your special pets. We're here to help! We're here to answer any questions about your rabbits and small furries.